Is this the right career for me? It’s a question most of us are likely to ask at some point in our career. NAIL IT!® gives you the tools to answer this important question. And whether you answer ‘yes’ and you want to advance in your career, or you answer ‘no’ and you need to transition to something different, NAIL IT!® has illustrative examples, stories, and exercises that will help you on your path. Simple steps to a good job make for a self-help book that works. Karen Kelloway’s approach to career success and enjoyment was born out of a desire to do things better. Before transitioning into executive coaching, Karen was a communications and public relations manager. She worked across Canada, from a ski resort to magazine editorial rooms, governments, PR agencies, even a chemical plant. Her desire to better engage and motivate employees evolved out of these experiences. As an executive coach, Karen has spent more than two decades guiding people through career transitions. She is driven to inspire people to match their passions, values and challenges to their chosen profession. She loves seeing people succeed. Karen answers the question, “Can I do it well and enjoy the process?” with a resounding yes. Through coaching and writing she successfully brings together her observations, stories and advice to prepare the reader to step forward and Nail It. If you are seeking more meaning and enjoyment in your working life, this book is for you. 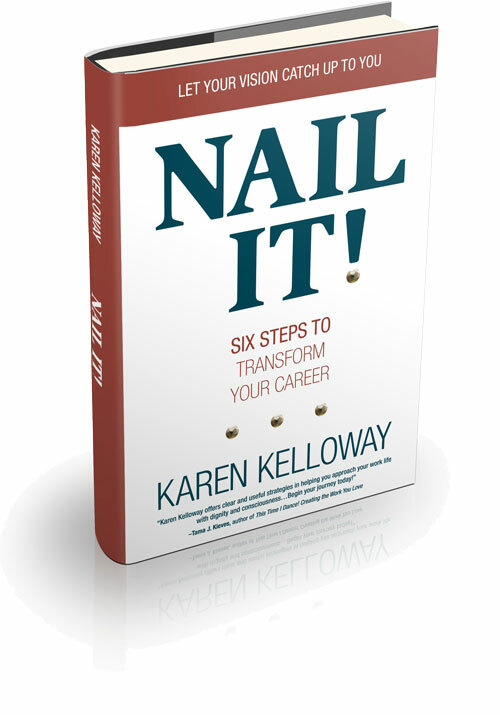 NAIL IT : Six Steps to Transform Your Career is also a trademarked coaching program for aspiring professionals. The program has become a successful tool for career pathing, succession planning and role development. Based in Halifax, Nova Scotia, Karen is a Certified Executive Coach through Royal Roads University, and holds a Bachelor of Public Relations through Mount Saint Vincent University. Karen is the winner of the Progress Women of Excellence award for Communications. She lives in Halifax, Nova Scotia, with her husband, Stephen, and two children. A portion of her book sales goes to breakfast programs, helping to keep kids well-nourished and ready to learn.